Right now, my tail gunner, Jock, is batting away at the piano and every now and again is playing ‘Yours’ which just about makes me weep. He was a pipe fitter and is quite a lot of fun and is half mad. But he is a good gunner and a nice chap. He is married and has a couple of children. 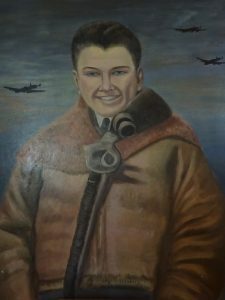 Donald Plaunt was one of seven crew members that was killed the night of March 12/13, 1943, when their Lancaster R5607X went down near Wulfen, Germany, just north of Essen. As the captain, he was in charge of the aircraft at all times, even if an officer of higher rank was on board. Each member had a different and important set of skills that contributed to the efficient and safe execution of the operation. A weak link could mean disaster for all. Unfortunately, I don’t have much information about some of the crew, but hopefully if family members of these crewmen find this website, they will be able to contribute additional information. After hearing that there was information about some of Donald’s crew I decided to add what I could find about each of them to this website. 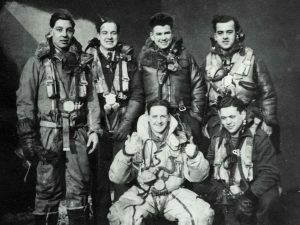 A Lancaster bomber had a crew of seven. Donald was the pilot and the Captain. 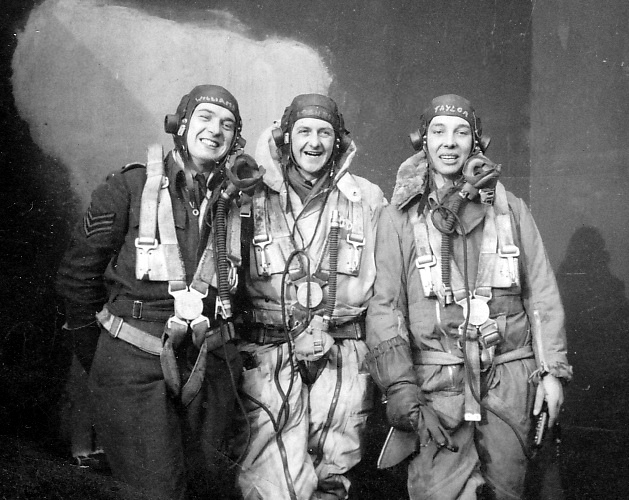 His crew: (back row) Joe Taylor, gunner; Trevor Williams, flight engineer; Jean-Louis Viau, bomb-aimer; (in front) Jock Lochrie, rear gunner, who was not on the fatal flight on March 12, 1943; and Ralph Franks, wireless operator. The 7th person, Alex Smith, the navigator, presumably took the photo. The crew who were with my uncle the night of March 12/13 have an asterisk (*) beside their name. 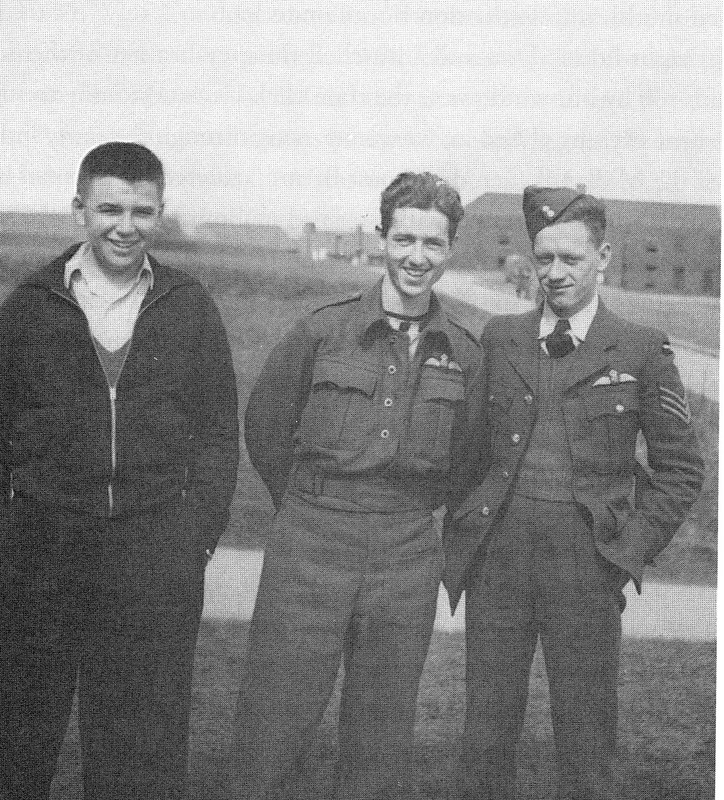 Before Donald became attached to his bomber crew he was in contact with his many friends from his training days, his school and his two closest friends, Syd Smith and Billy Lane, from his home town of Sudbury, Ontario. He spent time visiting Syd and Bill on their bases, or taking leave together whenever their leaves coincided. 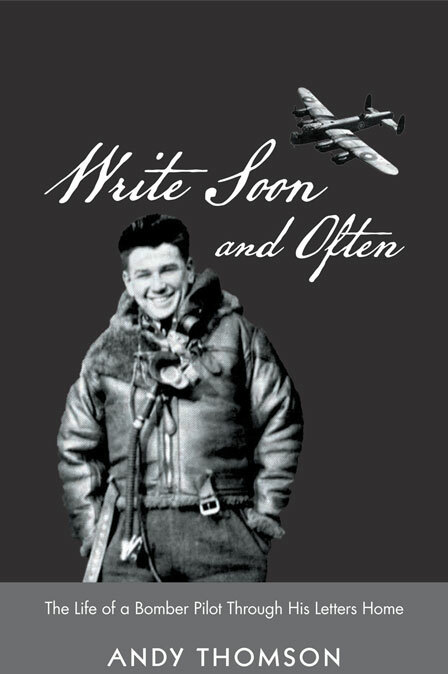 Along with the letters from his family, it was these friendships that sustained his morale, as it did with other airmen, all so very young, and craving relationships with those they knew well. His two friends were also pilots: Syd of a Wellington, and Bill, a Spitfire. 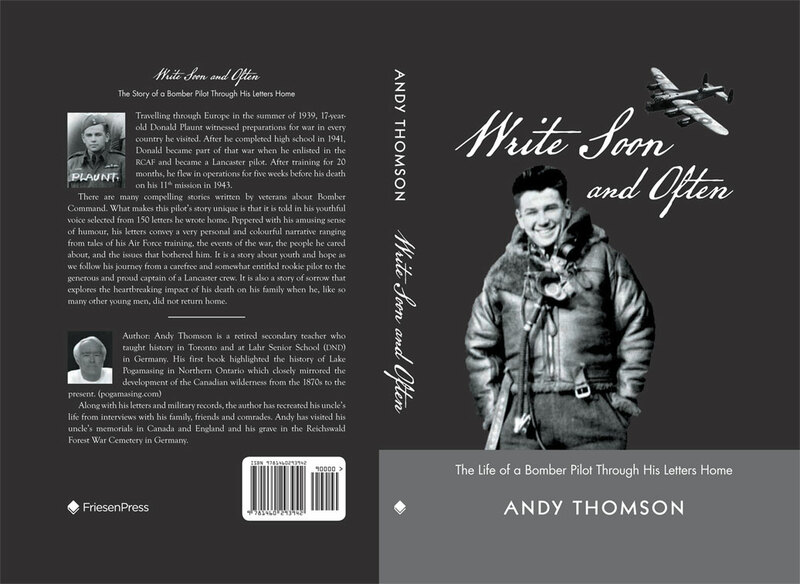 Syd was the only one that survived the war and near the end of his life published a book about his war experiences entitled: “Lifting the Silence.” Billy was killed almost one month after Donald and I have found some web pages that outline his time in his RCAF 403 Squadron. Donald became friends with Billy Lane when they attended Central Public School in Sudbury. After Donald switched schools they later met up in Sudbury High School where they were involved in sports for their grade nine year. Syd was also involved with them at SHS, but he got to know Donald earlier through the Copper Cliff Cadet Corps. The three buddies socialized together at the YMCA Saturday night dances under the directorship of Joe Barrett, who would later meet them during the war as Joe managed a Y in London. Syd’s book described their friendship as the “Three Musketeers” and as a tribute and honour to his lost buddies, named two of his sons in their honour: Donald Cameron Smith and William Thompson Smith. 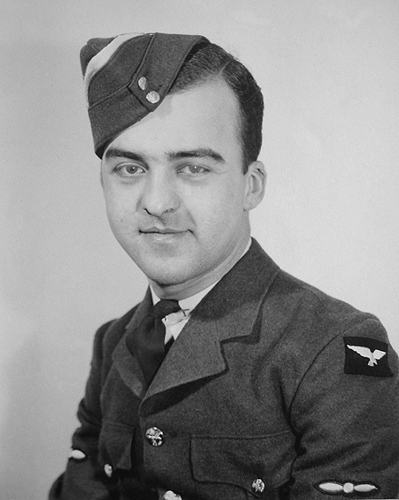 Bill was a Spitfire pilot with RCAF 403 Squadron, and was killed on May 15, 1943 in a dog fight near Dieppe, where he is buried in the Canadian War Cemetery. Syd was a Wellington bomber pilot with RAF 115 Squadron who was shot down north-east of Paris. He was first hidden there, and then taken through the French underground from Paris to Gibraltar in time to be back in London for the final reunion of the Three Musketeers in February, 1943. RCAF Squadron 403 Tribute to P. O. William T. Lane Click below Lane’s photo for more information. “Lifting The Silence” by Sydney Smith and David Smith, Dundurn Press, Toronto, 2010.